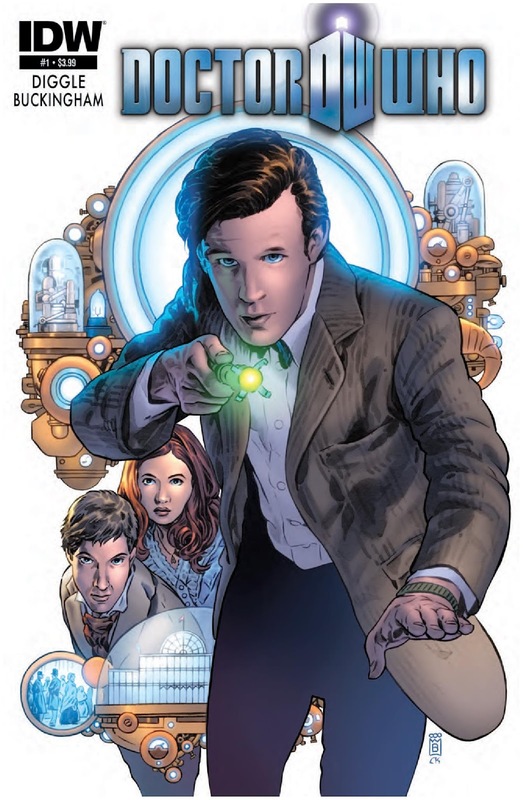 The Fellowship was fortunate enough to obtain a copy of DOCTOR WHO SEASON THREE #1 from IDW Publishing. The story is written by Andy Diggle and art by Mark Buckingham. The Doctor, Amy, and Rory have arrived in 1861 London to attend The Great Exhibition at the Crystal Place. They are brought into a police case that involves Charles and Emily Fairfax. Emily claims to be a medium that uses her “skill” to communicate with the dead. Who has she been communicating with and what are their intentions? And what about the strange machine her husband had built based on the information she “received” from them? I don’t watch the current series, so I am not sure how well Mr. Diggle captures the voices of the characters. However, I did enjoy his run on THE LOSERS and thought this issue is a good beginning to an interesting story arc. There is a nice little mystery here with Emily and her talent and I'm curious to see where this will lead. Mark Buckingham’s art is solid and beautiful as always. I must mention the nice color job by Charlie Kirchoff. DOCTOR WHO SEASON THREE #1 is in stores now and available at www.idwpublishing.com.